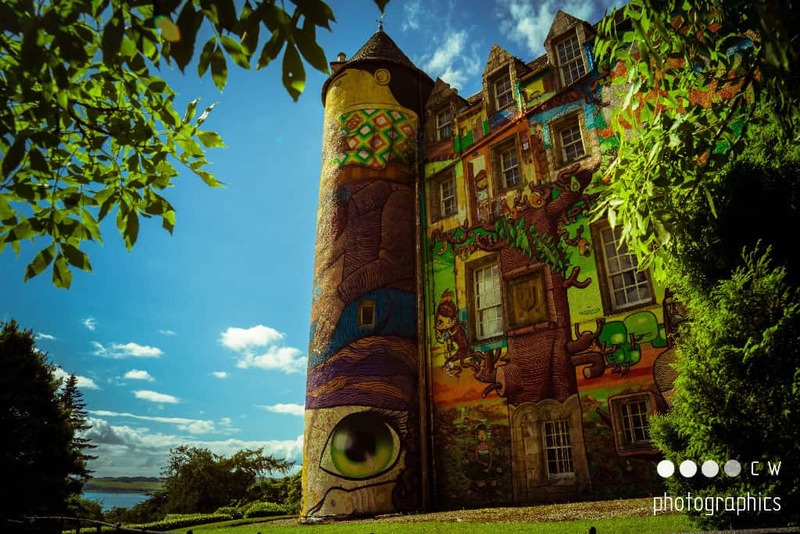 The idea was simple and original: take the vibrant and often transient art form of Brazilian graffiti, out of its predominantly urban context and apply it to the ancient and permanent walls of an historic rural castle in Scotland. Kelburn brought together four of the world’s leading graffiti artists from Brazil to work alongside Scottish talent, to create a unique burst of colour, embracing the walls and turrets of the south side of Kelburn Castle. On a building steeped in rural conservative perceptions, this bold and shocking artistic statement received huge media attention, while challenging the public’s understanding of both urban graffiti art and the British institution the building represents. The project involved the artists and organizers living together in the Castle for approximately one month, documented by various forms of media. The artists had time to share and explore new ideas, from both sides of the equator, culminating in a one-off, giant piece of collaborative art. In 2011, the mural was named as one of the world’s top 10 examples of street art by author and designer Tristan Manco – on a par with Banksy’s work in Los Angeles and the Favela Morro Da Providencia in Rio de Janeiro. A visit to the Garden Party is not complete without spending some time up close exploring the incredible details of this unique artwork.